A post in an occasional series wrapping up a few brief transporty things from the last week or two. This might be the least crowded train I’ve ever caught. That’s because it’s a pretend train, a mock-up of a carriage and a half, somewhere in a warehouse in outer-suburban Melbourne. I got to see it last week on behalf of PTUA — we’ve been included in stakeholder consultations this year on the design. It looks pretty good, and has more places standees can hold on than the current Siemens and Comeng fleet, but could do with more still. There’s photos of the mock-up over on the PTUA web site — take a look (and please consider joining if you’re not already a member — the PTUA’s work is only possible thanks to member subscriptions). A few weeks ago The Age reported on Transdev’s plan for a busway from Doncaster to CBD. It would have been cheaper/more achievable than Doncaster rail, remembering that a lot of benefits of Doncaster rail would be gained by first doing the cheap easy bit: rail to Bulleen, and feeding all the buses into there. The plan has officially been knocked back. The question is: can the problems of greater capacity (to cope with crowding) and speed (to encourage more people out of cars) be resolved another way? Better traffic priority along Hoddle Street, Victoria Parade and Lonsdale Street is the key: both bus lanes where missing, and traffic light priority. More articulated buses would help with capacity. There seem to have a handful now, but not many. I’ve been asked about this twice this week alone, once online, once in the barber shop this morning. Can the Skyrail (under construction from Caulfield to Dandenong) handle freight and V/Line trains? The rumour that it can’t persists. It’s not an entirely silly question. Freight trains in particular can be heavier than passenger trains, and the diesel locomotives used for freight and long distance V/Line services to Bairnsdale are heavy beasts. The answer is an emphatic yes, they will run on the Skyrail — just as they run on the 1970s era viaduct between Flinders Street and Spencer Street stations. WILL YOU CONTINUE TO RUN DIESEL TRAINS ON THE OLD TRACKS UNDERNEATH THE NEW RAIL LINE? The new elevated structure will be designed to safely carry both Metro passenger trains and diesel freight trains. Just as passenger and freight trains share tracks currently, they would continue to share tracks in the elevated design. The tracks underneath the elevated structure will be removed to create new community spaces. It’s fascinating that this rumour continues to do the rounds. And it’s certainly not helped that this completely discredited Railpage article from five months ago has never been corrected. By the way, now that construction is in full swing, the photo above, and the one below show just how close the elevated rail will be to some people’s homes/gardens. It’s not hard to see why some residents aren’t too happy about it. Is there a planned rollout of the new trains onto other lines after the Metro tunnel line? And the enforcement of the existing bus and T2 lanes would make a big difference. As would the continuation of the outbound Victoria Pde bus lane through the slip lane into Hoddle St meeting up with the T2 lane. 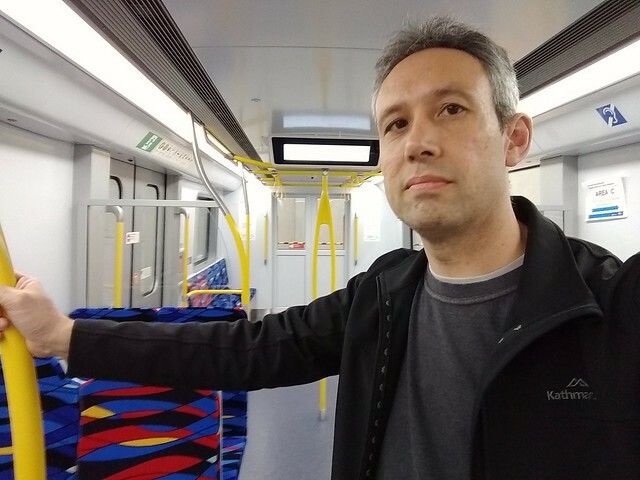 @Ben In fact the current rollout of 65 trains onto the Dandenong/Sunbury corridors will be completed by 2023 before the metro tunnel opens. According to the Rolling Stock Plan in 2015, there will be an extra 38 will be built for other lines so the Coming fleet can retire by 2026. As for the Doncaster bus proposal, not sure here. If you think about it wouldn’t more buses in the outer growing suburbs be more beneficial. Infrastructure Victoria kinda recommend it 5-10 period, but warned that it has limited benefits involved. Its on pages 240-242 in this document. Not sure we’d want Transdev running an element of the system for 30 years unchallenged. Interesting to watch the development of housing along the RRL at Tarneit and Wyndham Vale – plenty of room between the rail and residential, with no new houses backing on to the rail. Daniel, can you tell us more about the hearing assistance sign behind you in the first photo? Does a hearing loop, for hearing aid users, cover the whole carriage and the whole train? Will there be text and other visual notifications for non- hearing aid users (eg passenger information display showing more than only the “next station”)? There could probably be a whole blog entry dedicated to disability accessibility features! Steve, you should take a train ride from Victoria Park to the city. You will ride on a lot of elevated railway stations. Not sure when the viaducts were built though. I do think the Monash Uni station should be elevated. The SkyRail thing shows that a railway – or even a mock viaduct made of Styrofoam/Thermocol – should now be built in the median of Nepean Hwy before NIFOMYs start living next to Nepean Hwy. And before “air rights” are sold for peanuts to private shopping malls (Southland). Daniel, is the Skyrail designed to allow 2 more tracks in the median of the now-being-built elevated tracks? When the third and fourth tracks are built you will just ‘fill in the gap’ between the elevated structure? The gap in the structure has been put in place to ensure that the spaces under the structure receive natural light and rain. This ensures that trees and vegetation can grow and helps ensure that the space underneath (including the pedestrian and cycling path) is more inviting. It has not been put in place to accommodate the third and fourth track. Although the design future-proofs for the addition of a third and fourth track, this is not projected to be required for approximately 20 years, and will be subject to a separate planning, design and consultation process. RRE1 on pages 641-644 of the Options Book that James linked to in his comment above). 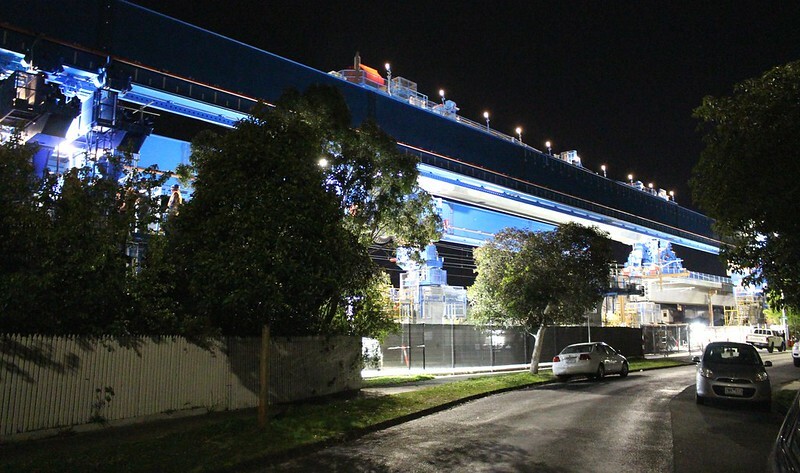 While RRE1 was identified as a key enabler for a new port at Hastings, in May Infrastructure Victoria recommended that new port (which won’t be required until 2055) be at Bay West, not Hastings. I did live right next to the elevated railway between Victoria Park and Collingwood for about a year in a rental house on Stafford St about 20 years ago – you got used to it. We can’t really know the answer without a crystal ball, but what infrastructure decisions will we make now that will be seen to be a mistake in 100 years’ time and require Skyrail-type intervention from future planners? Jacob, the section of rail between Princes Bridge (Flinders St) and Clifton Hill was opened 1901 – so those stations were built in the couple of years preceding. The double door buses are an interesting idea. A city in China which I visit often has recently opened a BRT, and is planning several more. The enormous stations in the middle of the road have “B R T” on them, in huge red letters, and none of them have any idea what it means. The BRT runs about 11 km from the old mainline station in the middle of the town, to the gigantic new highspeed rail station on the periphery. There is also a new metro line which takes about 17 km to go from the same point to point, a much longer way, and takes about the same time. What they really need is a shuttle train between the two stations, about 9 km and would be super-fast. The BRT stops at staggered island platforms along the centre of one of the main boulevards. This requires doors on both sides, a lot of the buses continue off onto other feeder routes with normal kerbside stops. Unfortunately, the effectiveness of the BRT is crippled by very bad light phasing at a few key intersections.